Take back the net and take back EU politics! 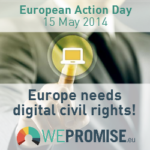 Civil rights organisations from across Europe invite you to participate in a day of action for the WePromise.eu campaign to demand that the next European Parliament defends digital civil and human rights. The European Parliament is taking more and more decisions that have a direct impact on our rights and freedoms. In the past five years, EDRi and other civil rights organisations from across Europe have been fighting for better data protection and privacy rules, the free and open internet, access to information and advocating for copyright reforms. The idea of the WePromise.eu is simple: We can act now to push for positive measures to support our freedoms and to make sure that there will not be more European proposals to carry out surveillance, to censor the Internet or to stifle free speech. 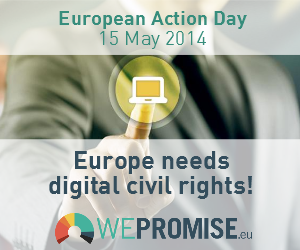 Candidates for the EU elections can promise to support a Charter of ten digital rights principles. Citizens promise to vote – for candidates who have, by election day, signed the Charter. Take a selfie! Personalise your message for the EU elections and upload it to our Tumblr. You can also contribute with a video, watch this guide on how to make your very own video statement. It will then be added to our WePromise channel. If you want to write to your candidates, please contact us at volunteer(at)wepromise.eu and we will provide you with the necessary info and guidance! If you want to blog or share the campaign with your friends, you can find sample tweets and more visual material below. You can join the Facebook event and personalise your FB and Twitter profile pictures. Check if and what is going on in your country. If your country is not in the list: make it happen! In the UK, Open Rights Group is organising a digital rights hustings in London. To participate, check their event page. – and ORG’s twitter feed.